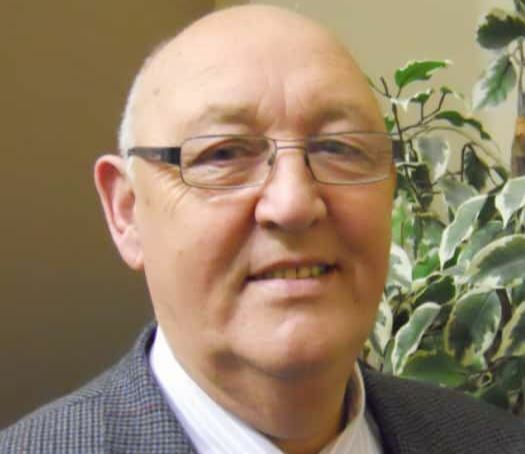 It is with deep regret that we inform you of the death of retired Chief Superintendent Barney Fitzpatrick, a resident of Portstewart, County Londonderry, Northern Ireland. Mr. Fitzpatrick died peacefully at the Causeway Hospital, Coleraine , on Saturday, 5 May 2018, surrounded by his family. Barney was born in West Belfast and always wanted to join the police. In 1967 he travelled to Scotland and joined Lanarkshire Constabulary. He served in Motherwell, Wishaw and latterly Bishopbriggs before transferring to the RUC in 1969 serving in Belfast. In the early hours of Saturday 27 February 1971, Barney was shot and seriously injured in a machine gun attack on Etna Road, Belfast. Sadly two of his colleagues, Detective Inspector Cecil Patterson and Constable Robert Buckley, lost their lives. Another colleague, Constable Robert Bamford received gun shot wounds to his leg. 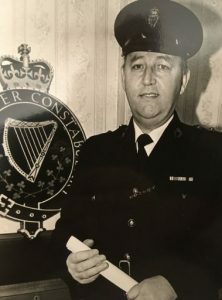 On return to duties he continued to serve in Belfast and was a Sergeant in the ‘bomb transit unit’ for two years until, in 1975, he was promoted to Inspector at Coleraine. He later served in Derry and in the Traffic Branch, returning to Coleraine in 2001 as Chief Superintendent. He graduated from the University of Ulster with a Masters Degree in Legal and Administrative studies incorporating European Law, he also had a postgraduate diploma in Business studies and management. On the 31st December 1998 having served almost 38 years in both the RUC and PSNI, Barney was awarded the Queens Police Medal for professional Police services to the public. At that time he was a Superintendent. He was also the holder of a Royal Humane Award for Bravery and had 11 Commendations for exceptional Police work. On retirement he had gained the rank of Chief Superintendent. Barney, a dedicated public servant, entered politics after retiring from the PSNI. He was first elected to the old Coleraine Council in 2006 and then re-elected to the current Causeway Coast and Glens Council as an Alliance representative. Alliance leader Naomi Long said her party colleague maintained his commitment to public service even as his health deteriorated. She added “Barney served the local community all his life, first as a police officer and latterly as a local councillor. Even over recent months in failing health, he continued to faithfully and diligently undertake his public duties at the council. He was a man of deep religious faith, who believed passionately in reconciliation and in healing the divisions in our community. Always gracious and generous in his dealings with others, he will be greatly missed by us all in the Alliance Party”. Mr Fitzpatrick is survived by his beloved wife Teresa, to whom he was married for 54 years, they married in October 1963. Barney was a much-loved father to their four children, Una, Sean, Brendan and Fiona and four grandchildren, Marianne, Catherine, Casey and Eli, all of whom live in Northern Ireland. Barney’s daughter Fiona passes this message to his former colleagues in Scotland, “We were all so proud of my father and he spoke of Lanarkshire often. He met lovely people there and had fond memories”. Barney’s Funeral Mass was held in St Mary’s Star of the Sea Church, Portstewart on Tuesday, 8 May 2018 followed by interment in Agherton Cemetery.